The 900Global Eon Infinite introduces the S71 Re-Loaded Hybrid coverstock wich was designed to offer increased backend motion on heavier oil conditions. The Olloid Symmetric core is designed to give this ball more length while maintaining energy and creating more hook potential down the lane. I drilled this ball identical to my original Eon looking to have two complementary balls, and that is exactly what I got. 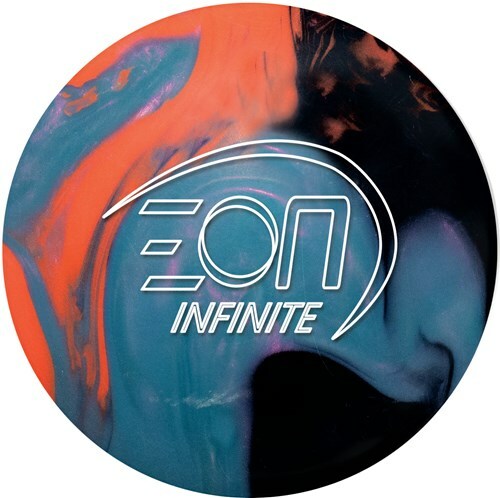 The Eon Infinite starts up a bit earlier than the original Eon and has more overall hook, but still does a great job retaining energy through the pocket. The S71 Reloaded coverstock on the Eon Infinite is noticeably stronger and does a great job cutting through oil. I've thrown this ball on both a broken down THS, as well as the WTB Tokyo pattern and was able to move left, send the ball right, and never worry about the ball not making it back to the 1-3 pocket. Once this ball was a little too much, it was a seamless transition back to the Eon. Fantastic 1-2 punch for any bowler. Can't say anything bad about this ball. Only thing I did is hit it with a 2000/3000 pad. I wanted a little earlier ball reaction. Also a ball for heavier oil. I got it drilled pin down. But that is me, I know we all are not the same. I'm very impressed! Rolls very smooth and continues through the pocket. Once I get some "Lane Shine" I can't wait to see this ball rack up the scores! I was very impressed with it to say the least. I'm back to bowling tournaments, and fishing. I've had the EI about 3 weeks and so far I really like the way it lets me read the lanes. I like its smoothe transition off the dry while maintaining a hevey roll. Bowled a two day Senior scratch tournament last weekend and this was my ball for the first 5 games, (8 game block). It helped me control the pocket from the fresh with good backends, until I had to get inside about 18-20. Once I got that deep it was ICE time. I had several guys eying the EI, they really liked the color, and the carry. Bowling in the Thursday Morn Senior Lge, (I love saying that) I had back to back 730-740's...with little or no moving all 3 games. volumes of oil. Stay in your comfort area and get one of these. Talk about strong. This ball packs a punch. I drilled it 50X5X45 Pin Up. It gives me good length with a rounded reaction to the pocket. This ball gets down lane clean and when it feels the fritction it turns hard however it wont over flip as iv'e see with other Hybrids. When it hits the pocket it has full continuation thru the pin deck. This hits hard and follows thru! I was rolling it on a pair that had league and open play on it and was able to still get it down lane and play lines anywhere from 15 board to 30 and keep it in the 1-3 pocket. This is a great addition to any arsenal.